Thank goodness (or, wickedness?) that Michael Dougherty's "Trick R Treat" has finally been released to the masses. 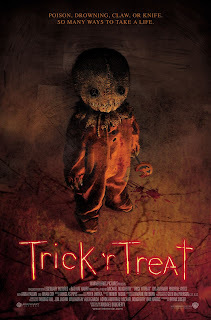 It is now cliche to say so, but in a horror film market so saturated with the latest Saw installment and remake, I do not understand why a film of such quality, like "Trick R Treat," has to wait two years to receive a direct-to-video release. Having said that, I will now descend my soapbox to tell you what I think of this film. See it. This is the kind of Halloween movie we have been waiting for: a movie actually about Halloween. I like to think that this is what John Carpenter might have had in mind when he decided to make Halloween III: The Season of the Witch and have the Halloween series be about movies centered around October 31. In a way, this film makes films like the original (real) "Halloween" and "Creepshow" proud. "Trick R Treat's" narrative is over the top. You are bombarded by creepy scenarios, odd characters, murder and other things that go bump in the night like a bursting bowl of Halloween candy. A child murdering principle, a young girl named Laurie who does not seem to follow the rest of her peers, children telling ghost stories to each other and an old man being terrorized by a trick or treater. The interweaving stories do so smoothly, and the effect is an excellent over-the-top horror film. Yes, this is an instant seasonal classic. Every character is memorable, and the acting talent here-- Anna Paquin, Brian Cox-- is stellar. And I do believe we have a horror character here who belongs up alongside Michael, Jason, Chucky and Freedy in Sam.